Botanical Name:- Coffea arabica Color & Odor Thick dark brown liquid & Roasted pleasant Normally, coffee plants grow in South American rainforests but it was first originated in Guatemala. These plants produce red fruits which are used to make coffee. The parts of the plants that are used in production are seeds – either roasted or green. There are two methods of extracting oil from these plants. The first one is the cold pressed method in which a low heat process is used for the purpose of extracting the oil from the plant. The second is CO2 method in which carbon dioxide is used to extract the oil. Both the methods are used to extract dark and thick coffee oil with a warming fragrance of recently brewed coffee. 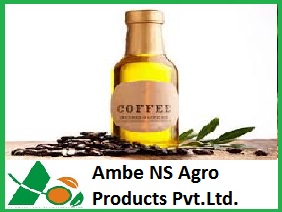 The main ingredients of coffee oil are Kahweol Diterpenes and Caffeine Cafestol.